When I was a kid, deciding which cookies my sister and I were going to leave for Santa was a very big deal. He had to have the best of our selection, and we had to make sure he had enough; he did have a long night ahead of him, after all. We also made sure that we left enough for him to take back to Mrs. Claus at the North Pole, as we instructed in the carefully crafted note that we left next to the cookies. Once we knew that Santa and Mrs. Claus were taken care of, our attention turned to the reindeer. They needed their energy if they were going to be flying all night, right? We varied our selections for the reindeer – some years it was carrots and others we decided to let them splurge and left sugar cubes. Our eyes would light up on Christmas morning when we found a plate of crumbs and a note that Santa left, telling us how good the cookies were and how much the reindeer enjoyed their special treat. It’s been at least five years since my mom’s cousin brought a tin of this deliciousness over to my grandma’s when she made her Christmas visit. My poor grandma, I’m not sure how much she even got to enjoy, with everyone else’s grubby little hands taking helping after helping. The stuff is ridiculously addictive, which isn’t exactly surprising, given that it’s sweet, salty, and covered in chocolate. My mom made sure to scribble down the recipe before her cousin left, and finally I’ve made it again. No sooner was it portioned into tins, it began mysteriously disappearing, handful by handful. This is an awesome treat to keep in your fridge for unexpected company during the holidays, and would also be fabulous packaged up in little goody bags to give away as gifts. Just make sure to save some for yourself. I guarantee no one else will want to share! 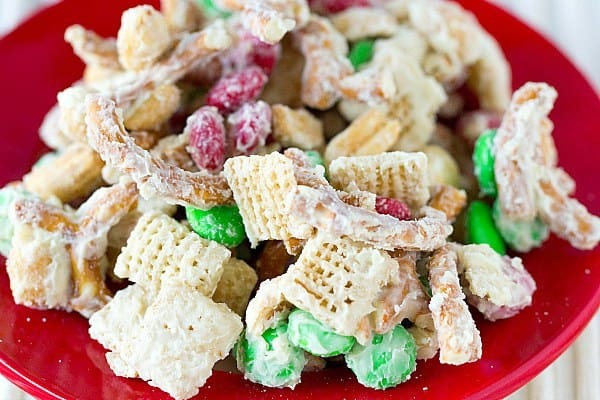 A delicious sweet and salty treat for the holidays. 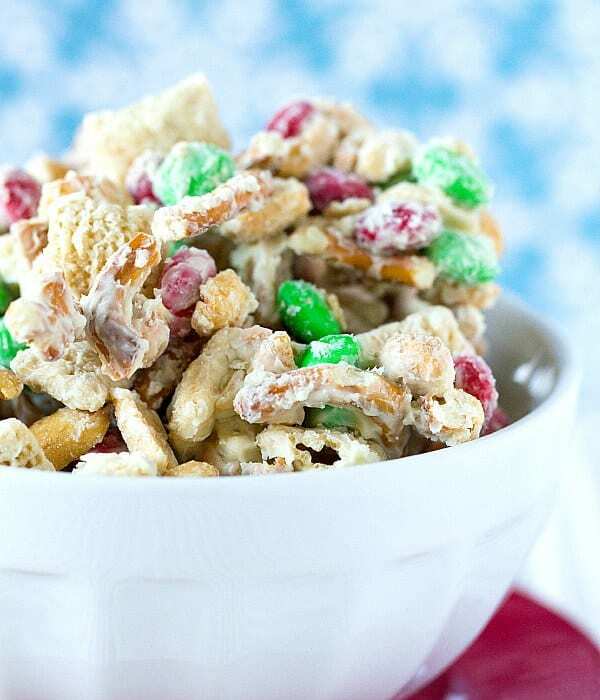 You can substitute white candy melts for the white chocolate and shortening. Line a large baking sheet with parchment paper or wax paper; set aside. 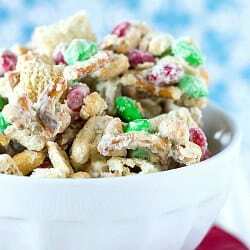 In a very large bowl, mix together the Rice Chex, Cheerios, peanuts, pretzels and M&Ms. In a medium bowl, melt the white chocolate and shortening in the microwave on 50% power, stirring every 30 seconds, until completely melted. Pour the melted chocolate over the dry ingredients and quickly toss together until everything is pretty evenly coated in the white chocolate. Spread the mixture out on the prepared pan and refrigerate until it's set, about 20 minutes. 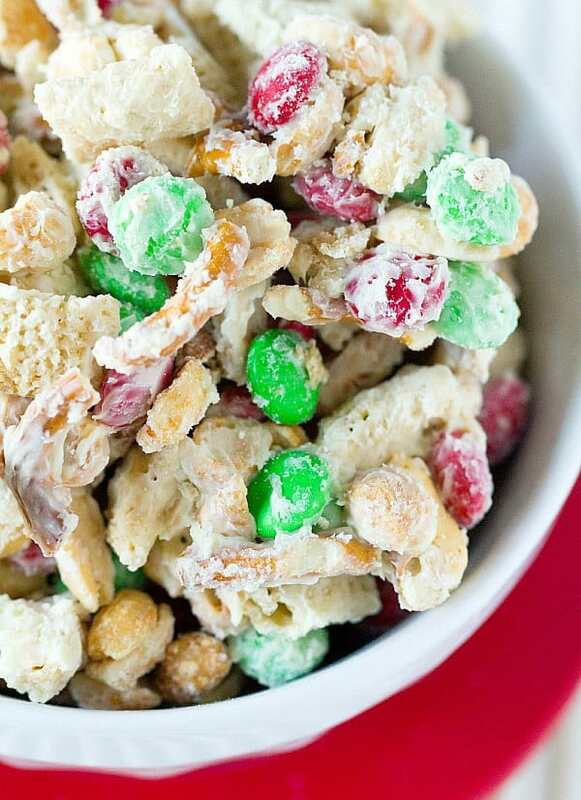 Break up any chunks and store in tins or airtight containers in the refrigerator for up to 4 weeks.